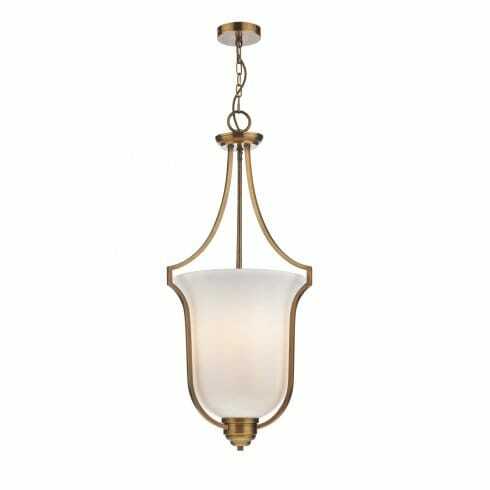 Dar Lighting Atrium 3 light ceiling pendant features a traditionally inspired lantern with a slender bronze frame. The frame elegantly curves around a central, bell shaped, opal glass shade that allows a warm and welcoming glow to escape when illuminated. The product code for this Dar ceiling fitting is ATR0363. The item itself will add a grand presence to classic decors and it is suitable for use almost anywhere in the home. Height can be adjusted prior to installation only and comes with 200cm of cable and chain to accomodate higher ceilings. Also available in a more contemporary, polished chrome finish which can be viewed and ordered from our website.